Yesterday, Nancy Keenan, president of NARAL Pro-Choice America (NARAL = National Abortion and Reproductive Rights Action League) wrote An Open Letter to Herman Cain. In responding to Cain’s interview with CNN’s Piers Morgan and Cain’s later statement to clarify his position, she condemns Cain for being 100% pro-life. She links to another blog entry at ProChoiceAmerica.org that details five statements Cain made between 8th June and 16th October in which he takes a strong pro-life position. …it comes down to it’s not the government’s role or anybody else’s role to make that decision. … I can have an opinion on an issue without it being a directive on the nation. The government shouldn’t be trying to tell people everything to do, especially when it comes to social decisions that they need to make. As to my political policy view on abortion, I am 100% pro-life. End of story. 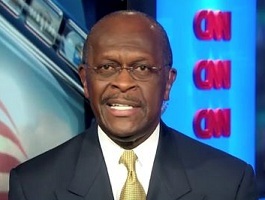 Abortion supporters do not like Cain; life supporters are unsure. Until Cain can quell our doubts, Cain is liable to be, as Shedlock put it, “A Man Without a Country”.